When you long to travel to the ends of the earth to discover your own inner explorer, it's not a matter of which destination to pick... it's which one to pick first. For over 25 years, Zegrahm Expeditions has taken inquisitive travelers to the ends of the earth to discover their own inner explorer. On one of Zegrahm's Overland Adventure's itineraries, virtually everything is included: gratuities, transfers, group hotels, wine and beer with lunch and dinner, and a variety of excursions including snorkeling and birding. Join this exciting itinerary that reveals the many wonders of one of Africa’s premier safari destinations. Enjoy fantastic photography and game viewing; May is the beginning of the dry season when large concentrations of animals gather around the shrinking water sources. Experience a wide variety of habitats from open plains and mopane woodland to the lush landscapes of the Okovango Delta. Stay in intimate camps in some of Botswana’s most remote protected areas to experience true African wilderness. Includes: Air transportation within Botswana; all excursions in the company of a world-class expedition leader and local guides; all gratuities; all accommodations; all group meals, including selected beverages with lunch and dinner; all entrance fees; arrival and departure transfers on group dates; gift certificates for recommended expedition gear and reading materials; and medical expense coverage and emergency evacuation insurance. 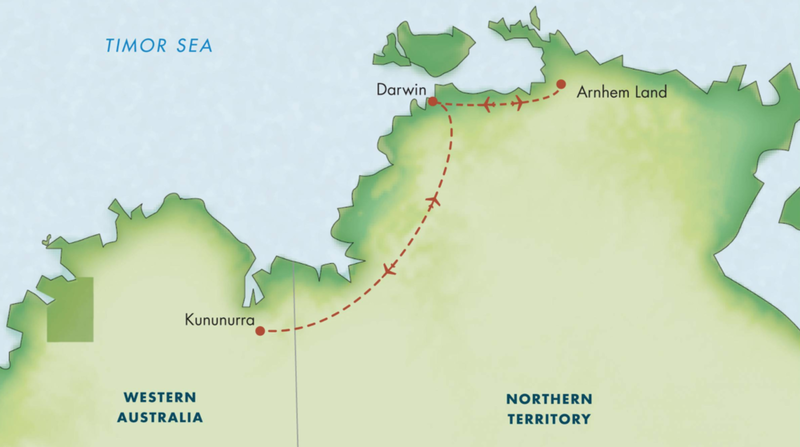 Take a flightseeing trip over Purnulu National Park (Bungle Bungle), a magnificent 3,000 square-kilometer park, with beehive-shaped sandstone domes featuring spectacular horizontal orange and gray bands, then explore the park on foot as you trek towards beautiful Cathedral Gorge. Take a cruise on Lake Argyle to search for rock wallabies, freshwater crocodiles, and a wealth of birdlife. Spend two nights at Davidson’s Arnhem Land Safari Lodge, nestled against rugged mountain ranges, fringed by billabongs, flood plains, paper bark swamps, and monsoon rainforests. Includes: Domestic airfare within Australia; daily activity options including nature walks, cruises, and cultural tours; all gratuities; all accommodations; world-class expedition leaders; all meals including soft drinks, beer, and wine with lunch and dinner; all entrance fees and taxes; arrival and departure transfers on group dates; gift certificates for recommended expedition gear and reading materials; and medical expense coverage and emergency evacuation insurance. Spend four nights at Chamba Camp Thiksey, and enjoy luxurious tents with en suite bathrooms, private decks, and stunning views. Explore Dharamsala; often referred to as “Little Tibet,” this is one of the best places to see Tibetan cultural traditions preserved and practiced, including a visit to the home temple of His Holiness the Dalai Lama. Photograph dramatic scenery throughout your journey—from soaring Himalayan peaks and deep valleys to rolling hills and dense forests. Experience a wealth of Tibetan Buddhist architecture in Ladakh, with the memorable opportunity to meet and talk with monks and students at the Tibetan Buddhist Lamayuru Monastery. Included: Air transportation within India; all excursions in the company of a world-class expedition leader and local guides; all gratuities; all accommodations; all group meals, including selected beverages with lunch and dinner; all entrance fees; arrival and departure transfers on group dates; gift certificates for recommended expedition gear and reading materials; and medical expense coverage and emergency evacuation insurance. Experience an authentic and private wildlife viewing adventure in one of Africa’s most popular safari destinations. Travel off the well-beaten path of the “migration trail” to revel in the peaceful atmosphere of Tanzania’s lesser-visited wilderness areas—Selous, Ruaha, Katavi, and Mahale. Stay in comfortable tented camps designed to blend harmoniously into the natural surroundings. Enjoy a variety of activities from game drives and walking safaris to river and lake cruises, as well as hikes along forest trails. Photograph myriad wildlife—lions, elephants, wild dogs, zebras, chimps, buffalo, and giraffes. Included: Air transportation within Tanzania; all excursions in the company of a world-class expedition leader and local guides; all gratuities; all accommodations; all group meals, including selected beverages with lunch and dinner; all entrance fees; arrival and departure transfers on group dates; gift certificates for recommended expedition gear and reading materials; and medical expense coverage and emergency evacuation insurance. Swim and snorkel with humpback whales, which congregate in the shallow, protected waters of Tonga to breed. Meet with locals to learn about their traditions of song and dance, create your own tapa cloth, and participate in a kava ceremony. Search for giant fruit bats, a variety of seabirds, and rare island endemics such as the Samoan fantail, Samoan whistler, Samoan starling, mao, and Tongan whistler. Stay at several boutique properties, which offer lush gardens of native vegetation and dreamy sunset vistas. Visit the National Park of American Samoa, America’s 50th national park and the only one south of the equator. Included: Air transportation within Samoa, Fiji, and Tonga; all excursions in the company of a world-class expedition leader and local guides; all gratuities; all accommodations; all group meals, including selected beverages with lunch and dinner; all entrance fees; arrival and departure transfers on group dates; gift certificates for recommended expedition gear and reading materials; and medical expense coverage and emergency evacuation insurance. Photograph Africa’s iconic wildlife and dramatic landscapes as you travel in open 4x4 vehicles, by boat, and on foot. Visit Kafue National Park, Zambia’s oldest and largest national park, and home to the once nearly extinct red lechwe. Search for Africa’s highest concentration of leopards in South Luangwa National Park. Observe mountain gorillas in their natural habitat during two days of trekking in Volcanoes National Park. Hike through dense rainforest in Nyungwe Forest National Park to see troops of chimpanzees and other primates, along with over 300 bird species. 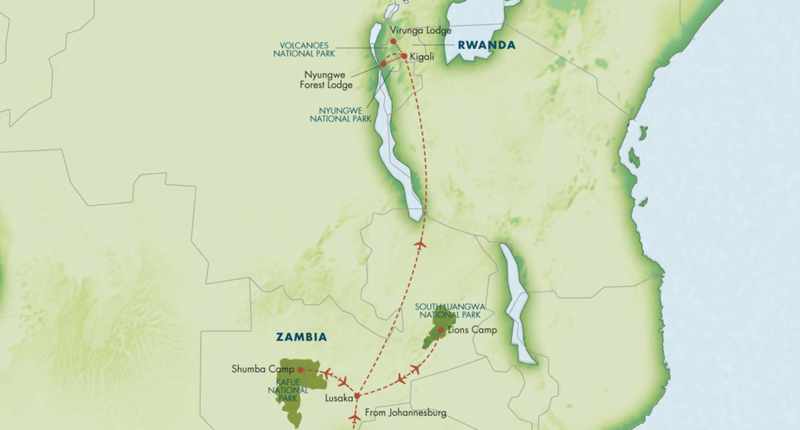 Included: Transportation within within Zambia and Rwanda; all excursions in the company of a world-class expedition leader and local guides; all gratuities; all accommodations; all group meals, including selected beverages with lunch and dinner; all entrance fees; arrival and departure transfers on group dates; gift certificates for recommended expedition gear and reading materials; and medical expense coverage and emergency evacuation insurance. To plan the details of your exotic Zegrahm Expeditions 2018 Overland Adventure, get in touch! We love helping turn travel dreams into reality.